Mangaluru, Apr 18, 2017: On World Art Day, the Artists’ Forum held a one-day art workshop for students of Asha Nilaya Residential School and Vocational Rehabilitation Centre for Special Children on Saturday. Though it is summer vacation, nearly 25 special children attended the workshop. The artists taught them various types of art including doodles, tattoo, origami, face painting, stencil, and clay modelling. 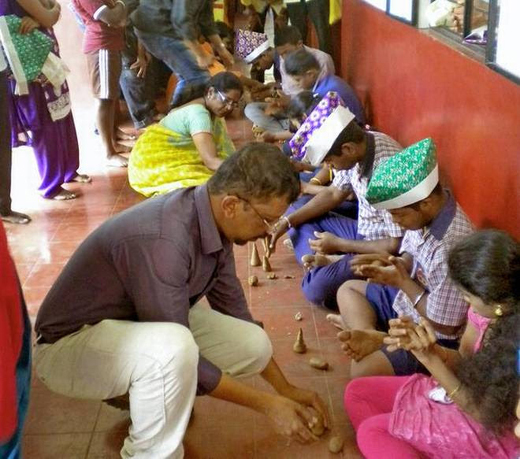 Ramesh Rao, senior artist and president of the forum, said the special children had hidden talents and the workshop was an attempt to bring them out. “We feel that colours have an impact on children. Here at the workshop, we saw joy on their faces,” he said. Sampat Kumar Pangala, artist and secretary of the forum, who conducted the session on origami, said art has an positive impact on minds of children. Shashikala Kotian, special educator at the school, said the camp would help the eye-hand coordination of children. “It would also help develop concentration. The children in our school like such activities,” she said. Special educator Shaila Amanna said the workshop should also be held after the school reopens. The forum held the workshop in association with Rotary Club Manipal Hills.